Vermont has garnered a national reputation for its award-winning specialty food and drink products and inventive, locally focused cuisine. For the last decade, Seven Days’ Vermont Restaurant Week has celebrated the state’s chefs, farmers, producers and others food-service professionals that have helped put the Green Mountain State on the map. The event has also raised $95,375.32 and counting for the Vermont Foodbank, the festival’s beneficiary. Seven Days is excited to announce the details of the 10th annual event presented by Vermont Federal Credit Union. For 10 days, April 26 to May 5, 104 restaurants from Brattleboro to St. Albans will offer special prix-fixe dinners at three price points — $20, $30 or $40 per person. Lunch, brunch and breakfast specials at select locations will also be available. The diversity in cuisine and participating restaurants will whet the appetites of diners across the state. The full list of menus can be found at vermontrestaurantweek.com. The Sweet Start Smackdown: Dessert comes first at this Restaurant Week-eve kick-off battle, in which local pastry chefs from every corner of the state compete and foodies feast. Scores from celebrity judges and votes from attendees decide the winner of Vermont Restaurant Week’s Signature Sweet. Thursday, April 25, 7-9 p.m., Higher Ground in South Burlington. Cooking With WhistlePig: Students learn how to prepare a three-course meal featuring WhistlePig Whiskey from a Cook Academy chef at the Essex Culinary Resort & Spa. Friday, April 26, Wednesday, May 1, Friday, May 3, and Saturday, May 4, 5-8 p.m. in Essex. Pints & Poses Yoga: Join Corey Grenier for an all-levels foodie flow in the brewery. This hourlong vinyasa-style class will focus on digestion, detoxification and mindful eating. End your practice with a pint or a flight. Sunday, April 28, 11 a.m. to noon, Burlington Beer Company in Williston. Culinary Trivia Night: Feed your brain with foodie trivia and compete for delicious prizes at this rowdy event emceed by Top Hat Entertainment. The grand prize is a $500 gift card to Hen of the Wood. Monday, April 29, 6-9 p.m., Nectar’s in Burlington. The Sensory Social: Cider and cheese? Yes, please! Join Shacksbury Cider and Vermont Creamery for a fruitful and fraîche guided tasting that will make your senses sing. Tuesday, April 30, 5:30-7 p.m., CO Cellars in Burlington. The Dish — The Wild World of Fermentation: Hear from brewers, farmers, chefs and business owners about their experiences with fermented products while exploring reputed health benefits, opportunities for preservation of local food, and whether this food trend is here to stay. Wednesday, May 1, 5:30-7 p.m., ArtsRiot in Burlington. Look for more information about events, participating restaurants and how to donate to the Vermont Foodbank at vermontrestaurantweek.com. 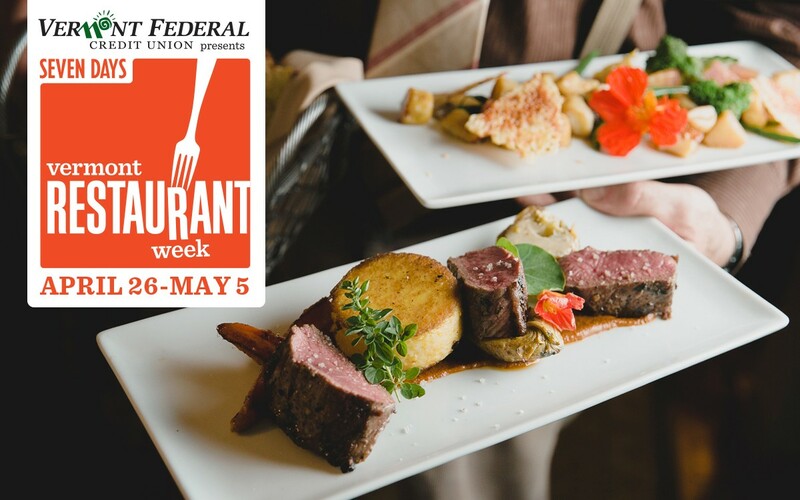 Vermont Restaurant Week is presented by Vermont Federal Credit Union and sponsored by Vermont Creamery, Burlington Beer Company, WhistlePig, City Market/Onion River Co-op, Shacksbury Cider and the Essex, Vermont’s Culinary Resort & Spa. Additional support is provided by Vermont Tourism, WNCS the Point, WCAX and Front Porch Forum.